Hypertrophic cardiomyopathy (HCM) is the most frequent congenital heart disease and the most frequently detected cardiomyopathy. The location of the hypertrophy varies at the level of the left ventricle and more types of left ventricular hypertrophy are being described (Maron types): limited to the anterior segment of the IVS (interventricular septum) – 10%, present in both the anterior and posterior segments of the IVS (20%), affecting both the IVS and the anteriorside loose wall (52%), and other areas, including the apical one (18%)1. The apical type of HCM was initially reported in Japan by Sakamoto and col2 and then by Yamaguchi and col3. This disease is common in Japan and it is estimated at 25% of the Japanese patients with HCM. In patients with non-asian origins, occurrence of this localization does not exceed 1-2%. The apical hypertrophic cardiomyopathy has typical features on ECG, ecocardiography and ventriculography. On ECG, it displays gigantic T waves and high R waves. Angiographically, in telediastole, the left ventricle cavity displays a configuration similar to “ace of spades”. Although this type of HCM has been reported to present a benign prognostic, a third of these patients may have severe complications, such as myocardial infarction, atrial fi brillation and cerebral stroke. The changes displayed by the ECG and the symptoms associated with HCM in the apical form sometimes look like coronary acute syndromes4. We report a case of symptomatic apical hypertrophic cardiomyopathy and ECG changes which mimics ischemic cardiac disease: 69 years old patient, with cardiovascular risk features (smoker, hypertensive, age, dyslipidemic, low tolerance to glucose), with symptoms such as: dyspnea of effort, angina of effort and palpitations, with paroxystic atrial fi brillation and TVNS documented on ECG Holter monitoring. Physical examination shows good general condition, rhythmic, clear, cardiac sounds, without pulmonary rales; with no murmurs on femoral and carotid arteries, peripheral pulse present in both limbs, to distally; BP = 130/90 mmHg, VA = 70 bpm. ECG: regular sinus rhythm, 50 bpm, QRS <0.12 sec=”” terminal=”” phase=”” changes=”” br=””> displayed as biphasic T waves in all leads but more accentuated in precordial ones. Echocardiography – good systolic function of the LV, EF 60%, with no signifi cant valvulopathy, with no hypertrophy of the VS walls, free pericardium, no pulmonary hypertension (the evaluation took place in the context of a difficult echographic view). Figure 1. Coronary angiogram, RAO 30°. 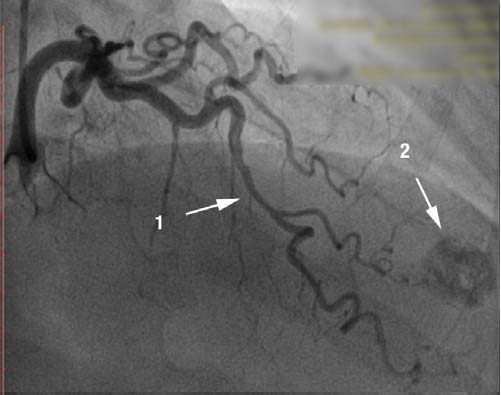 right coronary artery, with no lessions, dominant vessel. Round image, intensely calcified in the apex. Figure 2. Coronary angiogram. RAO 10°, cranial 40°. Muscular bridge in the medium segment of LAD with dynamic compression of 70%. Round image, intensely calcifi ed in the apex. Figure 3,4. Ventriculography. Incidence RAO 30°. Diastolic fi lling: the intense opacifi ed image visualised at the coronary angiography is a small apical aneurysm, trombosed and calcifi ed, which communicates with the LV cavity through a narrow channel which completely closes in systole . LVEF is 65%. Because of the symptoms, the ECG changes and of the risk factors associated with the coronary disease, we performed coronary angiogram which showed a right dominant coronary artery system (Fig. 1) with no signifi cant athero-sclerotic lesions but with intramuscular path of the LAD in the medium segment which causes 70 % dynamic compression (Fig. 2). 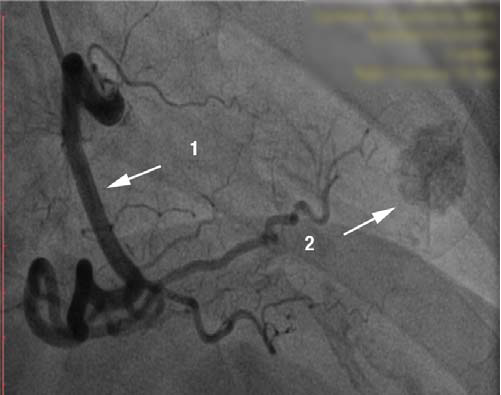 During coronary angiography, it was noticed an round, calcified shaped entity in the LV apex, which was influenced by the cardiac movement. (Fig. 1, 2). In order to have more information about this, ventriculography has been performed which showed that the patient had apical HCM; the round image, highly calcified in the LV turned out to be a small apical aneurysm, thrombosed and calcified (Fig. 3,4). cardiomyopathy and the coronary disease. Conflict of interests: none declared. 1. Maron MS, Maron BJ. Hypertrophic cardiomyopathy. Lancet. 2013 Apr 27; 381(9876):1457-8. 2. Sakamoto T, Tei C, Murayama M, Ichiyasu H, Hada Y. Giant T wave inversion as a manifestation of asymmetrical apical hypertrophy (AAH) of the left ventricle: echocardiogr aphic and ultrasono-cardiotomographic study. Jpn Heart J 1976;17:611–29. 3. Yamaguchi H, Ishimura T, Nishiyama S, Nagasaki F, Nakanishi S, Takatsu F, et al. Hypertrophic nonobstructive cardiomyopathy with giant negative T waves (apical hypertrophy): ventriculographic and echocardiographic features in 30 patients. Am J Cardiol 1979;44:401–12. ischaemic heart disease. Int J Cardiovasc Imaging 2008.